As Mick Jagger used to sing, “Yesterday’s paper’s are such bad news”, and no truer words could be spoken about the Hotel Sterling, which has been reduced to rubble, as of last week. While demolishing the Hotel is still a controversial issue among community members, looking back at newspaper coverage since 2001, provides some important clues about why the project may have ultimately failed. I did have this information up in another post titled “The Undead Days: Part 2”, which I am currently developing into another project about the Hotel Sterling, and as a result, had to remove the post from my website. While much of the post was just a silly mash-up story, I think it is important to put the newspaper excerpts back out there for anyone who would like to read and digest what nuggets of insight may be contain within the facts that local journalists covering the story felt were important to convey to the public. This is by no means a complete list of all news stories about the Sterling. But it may provide a starting point for anyone else who may be interested in delving into the topic, as reported to by the local newspapers in the past. 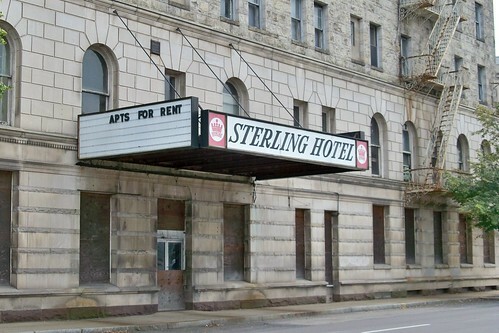 What did the interior of the Hotel Sterling actually look like at this point? Thank God one of thee ugliest buildings on earth is finally gone, The Sterling Hotel, a monument to hundreds of hard slaving cooks, waiters, bartenders, waitresses, & cleaning staff who were endlessly treated like garbage by rich patrons of that hotel.